During 2017 the Athens transport ticket system transitions from paper tickets to modern electronic tickets. With the new system, the paper tickets which were in use until today are being replaced by paper and plastic smartcards (similar to London’s Oyster cards). 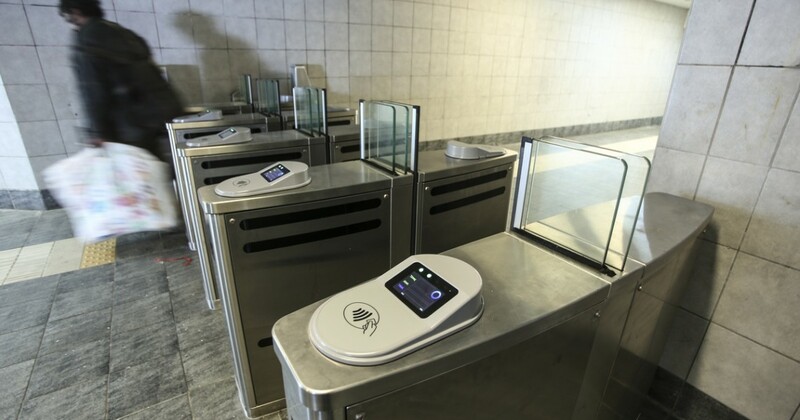 Riders of the metro system have to go through turnstiles which have been installed in all stations. This page was updated with information about the new system in October 2017. In the following weeks there will be extra information and improvement of the content. If you have any questions you can leave the comment and we’ll try to answer as soon as possible. 1. What are the different types of tickets and cards for Athens public transport? From 2017 a new electronic ticketing system is being introduced for the Athens public transport network, replacing the older paper tickets and cards. Fare prices will remain the same for now, however, the way you pay and use the tickets changes. Paper rechargeable ticket that can be used again and again as long as it remains in good condition. Ath.ena Ticket can be charged and recharged with products varying from a “90-minute ticket for all modes” to 5-day tickets. Airport transfer tickets and 3-day tourist tickets are available as well. Ath.ena Ticket can be bought from and recharged at all Athens transport ticket offices as well as automatic ticket issuing machines. Half-priced Ath.ena Tickets are available but only from Athens transport ticket offices. Plastic rechargeable card that can be used again and again. The anonymous Ath.ena Card can be charged and recharged with products varying from a “90-minute ticket for all modes to 5-day tickets. Airport transfer tickets and 3-day tourist tickets available as well. When a new anonymous Ath.ena Card is bought, it has to be charged with a bundle of five 90-minute tickets for all modes, or any other ticket product costing at least €4.5. The anonymous Ath.ena Card can be bought only from Athens Transport ticket offices. 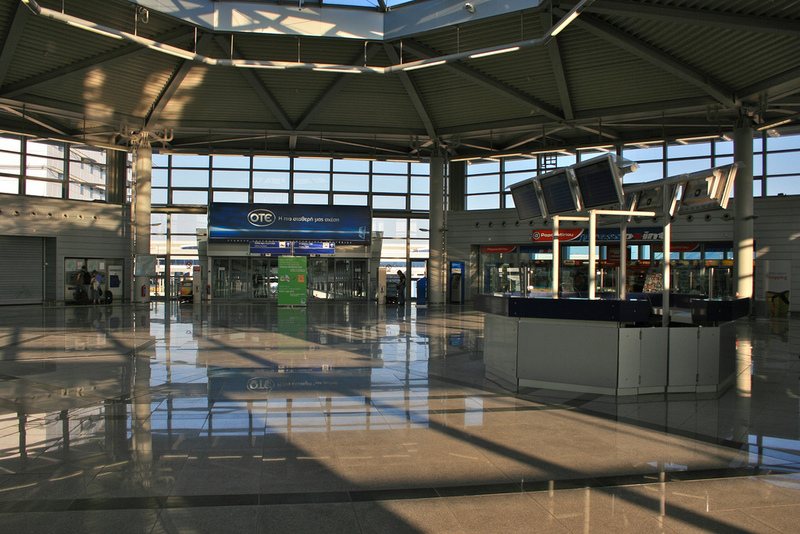 It can be recharged at the Athens Transport Ticket offices as well as the automatic ticket issuing machines. There are no half-priced ticket products available through the anonymous Ath.ena Card. It bears the photo and name of the passenger it belongs to. 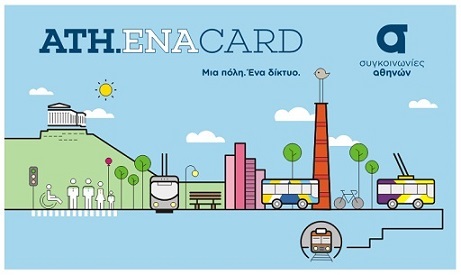 The personalized Ath.ena Card can be charged and recharged with all Athens transport products varying from “One 90-minute ticket for all modes” to 365-day tickets. Personalized Ath.ena Cards are issued empty and can be charged by their owners with any ticket product they wish. Cards are issued at most -but not all- Athens transport ticket offices. An online application can speed up the issuing process. To issue a personalized Ath.ena Card, a Greek ID card and an AMKA certificate is required. Alternatively, for non Greek citizens, personalized Ath.ena Cards can be issued with a passport. 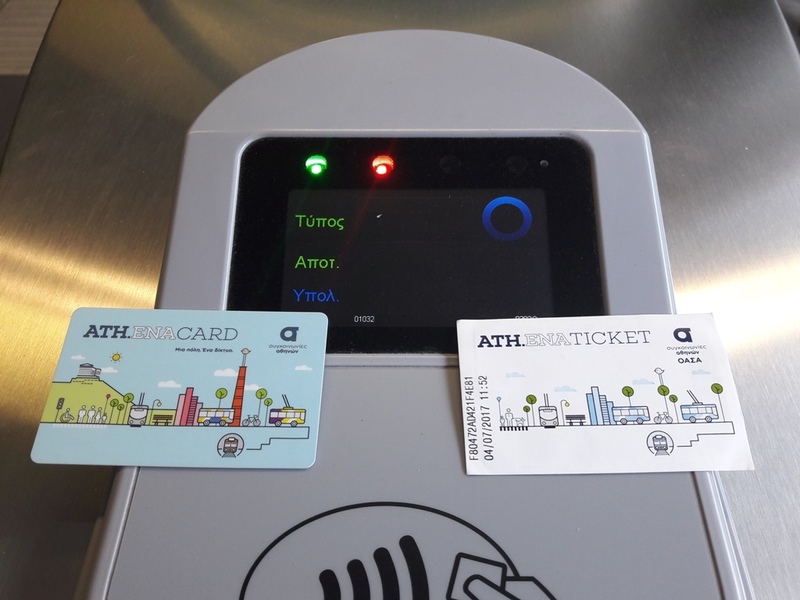 Cards can be charged and recharged at Athens Transport ticket offices, ticket issuing machines and online using a smartphone or tablet with NFC technology. Personalized Ath.ena Cards that can be charged with half-priced products are available as well. Can be bought regardless of when they are going to be used. Any ticket product is valid with the first “touch in” of the card. Ticket products that aren’t used remain indefinitely inside the Ath.ena Card or Ath.ena Ticket and can be used in the future as long as the ticket or card remains in a good condition. All types of tickets can’t be bought online at the moment. However, personalized Ath.ena Cards can be charged and recharged online. 2. What ticket products can I charge my Ath.ena Ticket or Ath.ena Card with? At this moment you can charge and recharge your Ath.ena Ticket or Ath.ena Card with a number of short-term and long-term ticket products, as seen in the following 3 tables. You are also be able to charge your Ath.ena Ticket or Card with directly with an amount of up to €50, without having to buy a specific ticket product. All of the above ticket products can be used for an unlimited number of transfers on: city Buses (excluding Airport express buses and X80 line), Trolley-Buses, Tram, Metro (all stations except Airport), Suburban Railway (only the urban section, no Airport). 90-minute tickets are valid for 90 minutes after the first ‘touch in’, 24-hour tickets for 24 hours after the first ‘touch in’, and 5-day tickets for 5×24 hours after the first ‘touch in’. For example, if the first time you use the 5-day ticket is at 10:05 am on Thursday it will be valid until 10:05am on Tuesday. Express bus tickets for the airport are valid only for one ride on an airport express bus, and no other transfer. Metro tickets for the airport are valid for 90 minutes after their validation for transportation and transfers on the same modes as the 90-minute tickets, plus a transfer from/to the airport with the metro. They are NOT valid for rides on Airport express buses. Tourist tickets are valid for: 1 round trip from/to Athens International airport by Metro or Express Bus and unlimited travel on all other modes for 3 days (72 hours after the first ‘touch in’), including line X80 (for example from 10am on Friday till 10am on Monday). Long term tickets are only available through personalized Athe.na Cards. Each ticket is valid starting from the first ‘swipe’, regardless of the day of the month, and until midnight of the last day. For example, a 30-day ticket that is first used at 2:20 pm on October 15 will be valid until 23:59:59 on November 14. Cards for all modes excluding airport, are valid for unlimited transportation and transfers on city buses (excluding airport lines and X80 line), trolley-buses, tram, metro (exlcuding travels from/to the airport) and suburban railway (only the urban section excluding airport). Cards for all modes including airport, are valid for unlimited transportation and transfers on these modes plus trips from to/the airport by metro, suburban railway or bus. 3. What kind of ticket do I need to travel from/to the Athens airport? NO other tickets are valid for travelling from/to the Athens airport and the city. 4. I’m flying to Athens for a few days. Any advice on which ticket I should use? It all depends on how you’re going to travel between Athens and the airport, how often you’re going to use public transport while in Athens, and how many days you’re going to stay. If you plan to stay in Athens for longer than 3 days, you will definitely need separate tickets for your Airport – Athens center (and vice versa) trips and your trips within Athens. Express buses from/to the airport (€6) cost cheaper than taking the Metro (€10). 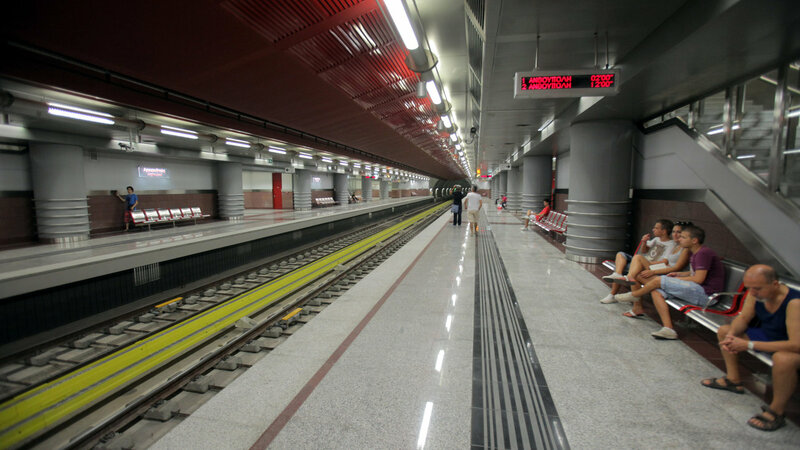 For your trips within Athens, a 5-day ticket for all modes (€9), or a 24-hour ticket (€4.5) if you don’t use public transport every day, might be cheaper than purchasing a 90-minute ticket (€1.40) every time you get in a metro station or take the bus. 5. Who can use a Reduced Ticket or travel Free of Charge? 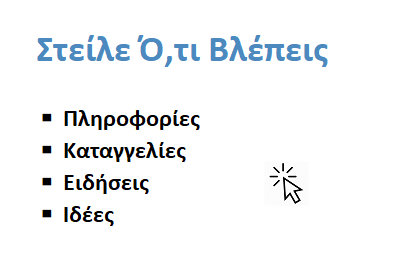 Students at public Greek universities and TEI (regardless of nationality, ERASMUS students included) as long as they have an academic ID card (issued online) with the indication “ΔΕΛΤΙΟ ΕΙΣΙΤΗΡΙΟΥ”. Students who study at universities outside Greece up to the age of 24 (including those aged 24, regardless of nationality), after showing a Student Card – University ID card and passport or ID card. Members of Greek families with 4 children or more, with a special pass. Children under the age of 6 (including those aged 6), regardless of nationality. No need to issue a ticket/card, children travel accompanied by an adult. Disabled persons, citizens of Attica region. Issue of personalized card required and monthly recharge required. If you are eligible for a half-priced ticket, you will have to either buy a half-priced Ath.ena ticket from a ticket office or issue a personalized Ath.ena Card. 6. How and where can I buy and recharge an Ath.ena Ticket? Ath.ena Tickets are available at every Athens transport ticket office, as well as on automatic ticket machines. You cannot buy an Ath.ena Ticket online. Credit cards are accepted at a number of ticket offices (and soon, at every ticket office and automatic machine). 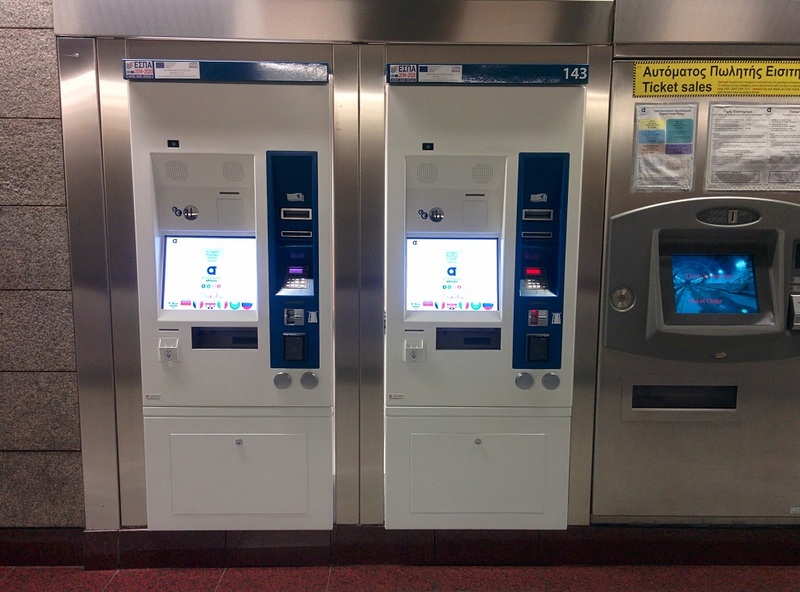 You can recharge an Ath.ena Ticket at all Athens transport ticket offices, as well as on automatic ticket machines. 7. How and where can I buy an anonymous Ath.ena Card? 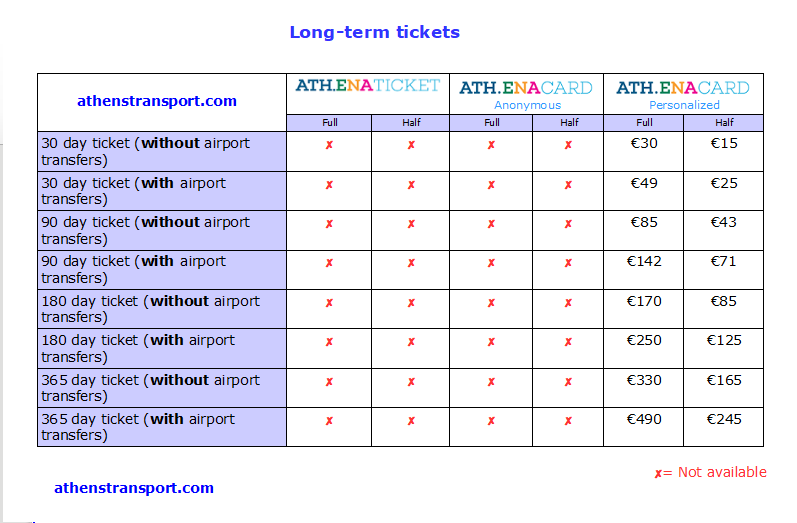 You can buy an anonymous Ath.ena Card from every Athens Transport ticket office. You cannot buy it on automatic machines or online. Credit cards are accepted at a number of ticket offices (and soon, at every ticket office and automatic machine). You don’t need to show any document in order to buy an anonymous Ath.ena Card. You can recharge your anonymous Ath.ena Card at all Athens transport ticket offices, as well as on automatic ticket machines. 8. How and where can I buy a personalized Ath.ena Card? You can only buy a personalized Ath.ena Card from a number of Athens transport ticket offices, located at metro stations. To issue a card for the first time, you need your passport (if you are a Greek citizen you need your Greek ID card and an AMKA document instead). For a half-priced card, you also need to show the appropriate document that proves you are eligible. An online application can speed up the process [link – only in Greek as of now] but you’ll still need to go to a ticket office in order to get your card issued. 9. How do I use an Ath.ena Ticket or Ath.ena Card? 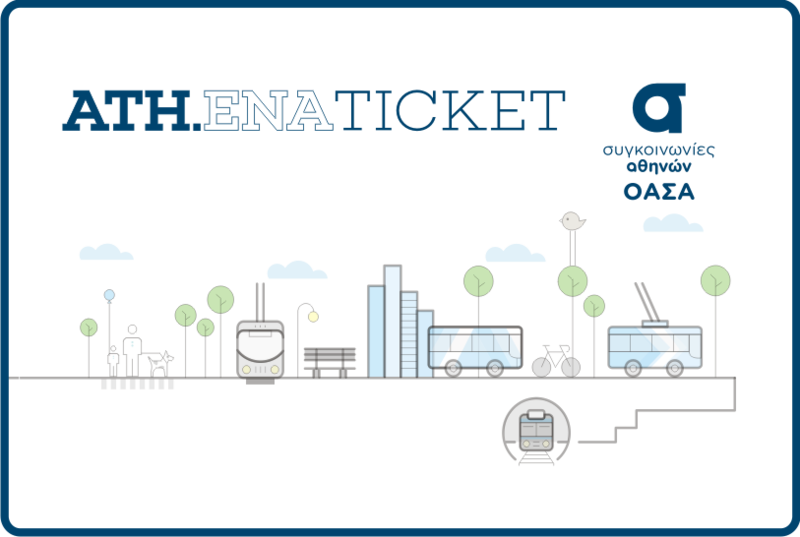 Ath.ena Tickets and Ath.ena Cards are made from different materials but use the same contactless technology. In buses, trolley-buses and the Tram, you use the blue card readers, installed close to all doors. You place your Ath.ena Ticket or Ath.ena Card close to the ‘contact point’, under the screen. A sound and message on the screen will let you know that your card is valid (you can also see the time or tickets remaining in the card). You need to touch in every time you get on a bus/trolley bus/tram, regardless of the ticket product you are using. You don’t need to touch in before exiting the vehicle. On the metro and suburban railway, you need to pass through the gates installed at every station. Use the card reader on your right side as you’re going through the gate. Again, a sound and message on the screen will let you know whether your card was read successfully. You need to do this as you enter AND exit every station. You can see the remaining time of your ticket while touching in the card and also at automatic ticket issue machines and ticket offices. 10. How about Athens Suburban Railway and other Railway tickets? Ath.ena Tickets and Athena Cards are accepted within the urban section of Proastiakos (Suburban Railway) as well as Airport station. 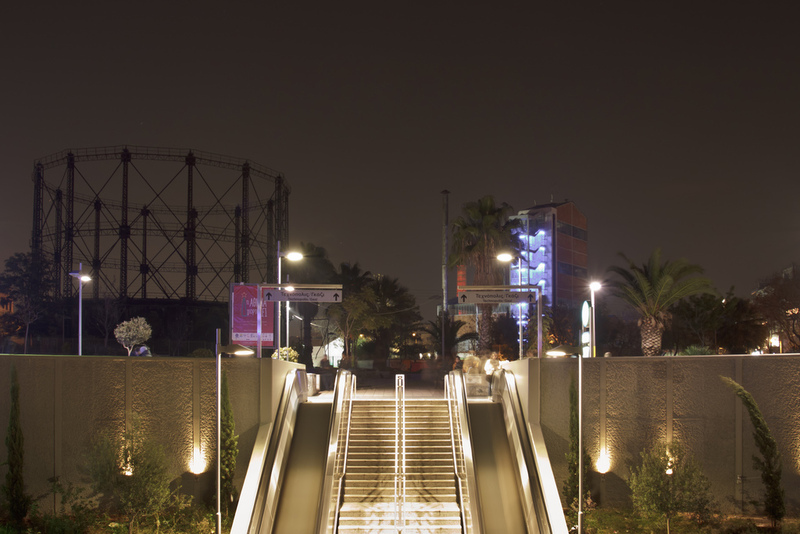 For journeys from/to Athens Airport to/from any station within the urban section, metro tickets for the airport are valid. For other journeys from or/and to any other station outside the urban section, different fares apply. (More info at TRAINOSE website).